This autumn the world will mark the tenth anniversary of the start of the US and its allies-led war against the Taliban. This is the right time to reflect on how well Western leaders and military commanders have learned the lessons of the Soviet military presence in Afghanistan. The US and its allies will have to think much beyond the so-called exit strategy and military victory to stall the second coming of the Taliban. These two campaigns have much in common. There are, however, also differences, the chief one being that Moscow in 1979 sent its divisions in to protect a friendly regime from hostile forces, to prevent Afghanistan from dropping out of its sphere of influence. The West committed its troops to destroy terrorist bases. In the former case it was an episode in the global confrontation between the “socialist camp” and virtually the rest of the world, an episode that struck the final chord of the Cold War. In the latter case it was the White House’s response to 9/11. Thirty-two years ago, when the Soviet Union’s generals found themselves in a neighbouring country, they did not even bother to provide basic accommodation for their units. And why should they have? It was assumed that they would quickly defeat the bands of Islamic guerillas armed with outdated weapons and return to where they were permanently stationed. Before long it became clear that the bearded mujahideen were only the tip of the iceberg and that behind them were the colossal resources of the United States, Saudi Arabia, China, Pakistan, Egypt, Israel and a multitude of other states who made the most of the opportunity to declare the Soviet Union to be “evil empire,” to pull them into a drawn-out war of attrition and eventually win the Cold War. Today the coalition fighting the Taliban and al-Qaeda, on the contrary, has the support of practically the whole world, including the Russian Federation. But despite these seminal differences, there are certain similarities between these two events separated in distance and time. Thirty-two years ago, as soon as they entered Kabul, Soviet Special Forces began by liquidating Hafizulla Amin, the head of the Afghan leadership; Amin was suspected of collaborating with the CIA. Babrak Karmal was brought in to replace Amin and was thoroughly briefed by the Kremlin on how to run the country “correctly.” The US-NATO invasion was also preceded by the high-profile political assassination of Ahmad Shah Massoud, the only Afghan at the time who had a chance to become a genuine national leader. The official story is that forces close to the Taliban masterminded the murder, but if you talk with educated people in Kabul you will find that few of them give credence to this. True, Massoud had successfully resisted the attacks of radicals and was rightly thought to be their worst enemy, but everybody knows that he would never have agreed to see foreign soldiers on his land. He told this to me himself more than once. The truth is that at the time Massoud did not suit anyone, whether it be the Americans, the “black mullahs” or members of his circle who wanted nothing but to enjoy the spoils of the jihad victory. The way the assassination was organised and the tracks were covered up shows that serious professionals were at work. The Taliban? This does not look like their work. Be that as it may, things thereafter proceeded under the same scenario: it was the White House that installed at the Ark Palace, formerly the residence of Afghan monarchs, Hamid Karzai and then did everything to legitimise him in the eyes of his own citizens. The Soviets, especially in the early years of their presence, were zealously imposing on Afghanistan their own ideas of state structure and public life. The Americans, with suicidal doggedness, are committing the same mistakes, vainly trying to graft their “democratic values” on the Pushtus, Tajiks, Khazareans and the other inhabitants of wild mountains. The appearance of NATO and ISAF units in Afghanistan, like the invasion by the “limited Soviet contingent,” gave a powerful impetus for a guerilla war. As strange as it may seem, the more forces the coalition amassed beyond the Panj River, the worse the military and political situation became. One only has to look at the statistics of terrorist attacks, the casualty rates and the map of the territories controlled by the opposing forces. The West will never achieve victory in Afghanistan by purely military means. The Russians failed to achieve victory too, but arguably achieved many of their goals: after Russia pulled out of Afghanistan, President Najibullah’s regime held out for three more years against the onslaught of the mujahedeen, who had the support of the Islamic world and the West. Najibullah’s regime collapsed right after the fall of the USSR. In other words, Moscow managed to do what the West has yet to achieve: to create a viable government, to form, arm and train the army and police and to ensure control of most of the country’s territory. The Najibullah factor should also be borne in mind. He was a strong ruler reckoned with by the independent Pashtu tribes and the ethnic minorities in northern Afghanistan. It is not fortuitous that they would like Najibullah back: he would have been an ideal leader for today’s Afghanistan. The jury is still out on whether Hamid Karzai is such a figure. What price Moscow paid for this success is a wholly different matter. Many believe that the war against the mujahideen had a crippling effect on the Soviet economy, undermined morale, dramatically diminished support for the Soviet regime in the world and ultimately precipitated the demise of the communist world and the Soviet State. The price is still too great to be dismissed. But then the security of all of Western civilization is at stake. My foreign colleagues sometimes ask me why many Afghans, even former mujahideen, have fond memories of the Russians while showing no warm feelings for those who today risk their lives to defend them against the Taliban and Al-Qaeda. I think the answer is obvious. The trick is that we did not only fight the fundamentalists, but invested billions of dollars in various construction projects. 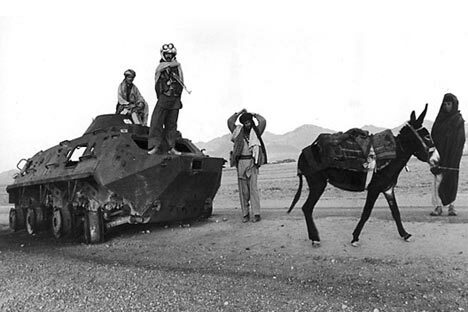 Almost everything Afghanistan has today – roads, bridges, tunnels, farms, schools, grain elevators, residential neighborhoods – were built by or with the assistance of the Soviets. Tens of thousands of Afghans were educated in Russia and other Soviet republics. Such things are not easily forgotten. Today, this is the only way to go to turn the situation around. Surgical military operations must be accompanied by important infrastructure projects that change the face of the country and the mentality of its people. In the early 1990s one could often hear people in Russia saying that “sending troops to Afghanistan was a tragic mistake, but pulling them out was an unpardonable crime.” The message being that we had no right to leave the country at the mercy of extremists. Winning the jihad turned out to be a Pyrrhic victory: chaos, civil war, still greater casualties culminating in the seizure of power by the Taliban, and Afghanistan becoming the centre of international terrorism. Twenty-five years ago such an outcome was, if you like, a logical consequence of the Cold War. Today the world is different. But the danger of such a catastrophe repeating itself has not subsided. From 1981-1992, Vladimir Snegirev worked in Afghanistan as a correspondent for several leading Soviet newspapers. He has written a number of books and film scripts, and is now working on an extensive study of the role of special forces in Afghanistan.